One thing about 2.0 mm pitch connectors is that they are widely used in the industry and very commonly seen in consumer electronics especially in laptops and VGA card fans, giving a current rating of 1.0 amperes. However, the 2.0 mm pitch connector is not as compact as the 1.25 pitch connector which gives the same amount amperage and voltage. For space-saving requirements, the 1.25mm pitch connector is preferred, reducing about 45% PCB of space consumption compared with 2mm pitch connectors. Enclosing the 2mm pitch connector is a crimp style lock designed by Scondar and a special configuration which prevents users from inverted insertion. 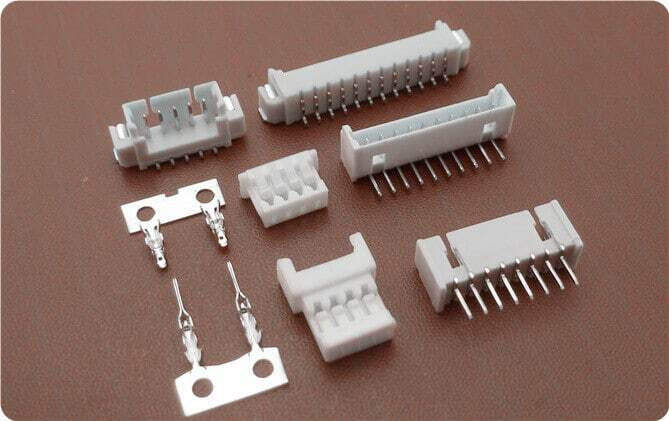 Like the 0.8mm and 1.0mm pitch connector, the 1.25mm pitch connector is also suitable for densely crowded electronic devices due to its small diameter wirings and lightweight design. Scondar offers a variety of 1.25 Pitch connectors with different models and in various dimensions, with top or side entry configurations which might suit your specific needs. As compared with the Molex 1.25mm PanelMate, the 1.25mm PicoBlade is manufactured with higher infill housing suitable for high density and crowded applications, withstanding higher strain and mechanical stress. In addition to the above flexibility in configurations of the 1.25mm pitch connector, Scondar also offers this connector with different number of circuits ranging from 2 to 17 which might suit your specific needs. A special feature of the 1.25mm pitch connector is it can withstand lower temperature settings than the 0.8mm pitch connector and 1.0mm pitch connector which makes it more suitable for equipment that experience wide range of temperature difference.The temperature range for this connector is -40 degrees centigrade to +85 degrees centigrade. This range is based on the rise of temperature with increasing current. Insulation resistance and contact resistance are of 100 M Omega per minute minimum and 20M Omega maximum, respectively. The 1.25mm Pitch Connector can be used for AC and DC operations with a rated current of 1.0 amperes and 50 Volts. It is applicable in both chassis wiring and power transmission wiring with a maximum amperage of 1.0Amp and 0.36 Amp, respectively. The connector can be used with the wires of AWG within the range of #26 to #32. This applies to wire diameters as small as 0.22mm to 0.4mm. Super fine wires such as these can help the routing job. 1.25 mm pitch serves as the best choice for densely crowded electronics systems for its small, square-edged configuration, ruggedized and shock resistant feature. The 1.25 mm Pitch connector can either stand as power contacts, signal contacts or both as power and signal contacts or a signal and grounding contact. The wiring harness interconnects the PCB to various components that sends signals and power to other electronic devices. 1.25mm pitch connectors ensures safety, system protection and performance with its bonded metallic conduits and multiple grounding points preventing fire hazards, component damage, overheating and possible electrocution. 1.25 mm Pitch Connector finds its advantage in devices such as, Multi-function/printer office machines, gaming electronics, Imaging and digital cameras, security systems, VCRs, PDAs, computer, notebook, speaker, LED television. Testing equipment are often used for quality control of products, experimentation and R&D.